Fate is defined as forces outside of your control that make things happen. It was fate that put Marco's picture on Craig's List for rehoming. Even though he is deaf. It was fate that caused a great Furkids volunteer to see the Craig's List posting. It was fate that allowed that volunteer to rescue Marco from a very uncertain future and bring him into the Furkids family. Because he was deaf and about to be homeless. 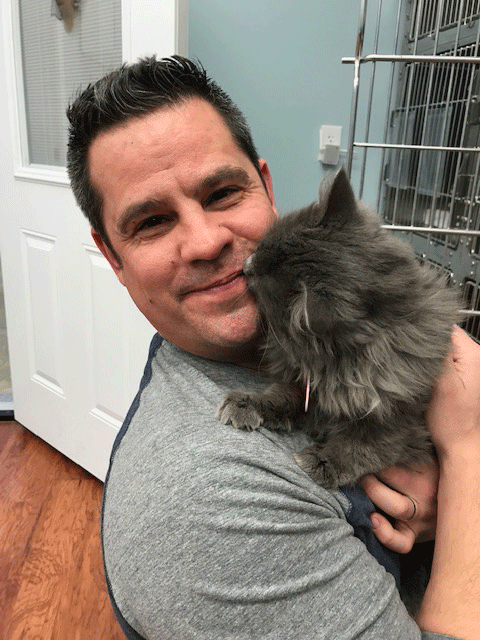 It was fate that on Marco's very first Caturday, Joe, who was visiting from New Jersey, stopped by the main cat shelter with some friends who were adopting. And it was fate that caused Joe and Marco to fall in love at first sight, ignoring Marco's deafness. Joe adopted Marco and flew back from New Jersey to pick Marco up. As soon as Joe opened the cage, Marco started giving him kisses. Because of fate, poor deaf Marco hit the jackpot! He now has cat and dog friends and lives in a loving home. We are so happy that fate brought Joe and Marco together! So many animals find themselves homeless because fate has been unkind to them. Furkids works every day to improve the destiny of the animals we encounter, since - after 17 years - we know that the course of fate can be altered with just one simple caring act. Here's to all of us working together to make a positive difference - one life at a time!